To be the provider of choice for advice on the development and delivery of ultrasound education and training and to be the only recognised accreditor for ultrasound courses. n 1993, CASE was formed through the common desire to ensure that the education and training of sonographers in the United Kingdom was delivered at the highest level. All members share common concerns that standards of service provision and education are developed in parallel with increasing demand and improving technology. All members strive to create an environment in which education and training is maximised. This will enable validation and accreditation to be as robust and straightforward as possible. CASE's philosophy is to promote best ultrasound practise through the accreditation of those training programmes that develop safe and competent ultrasound practitioners. The majority of its activities relate to supporting those Institutions that offer, or wish to offer, courses leading to an award in Medical or Clinical Ultrasound. 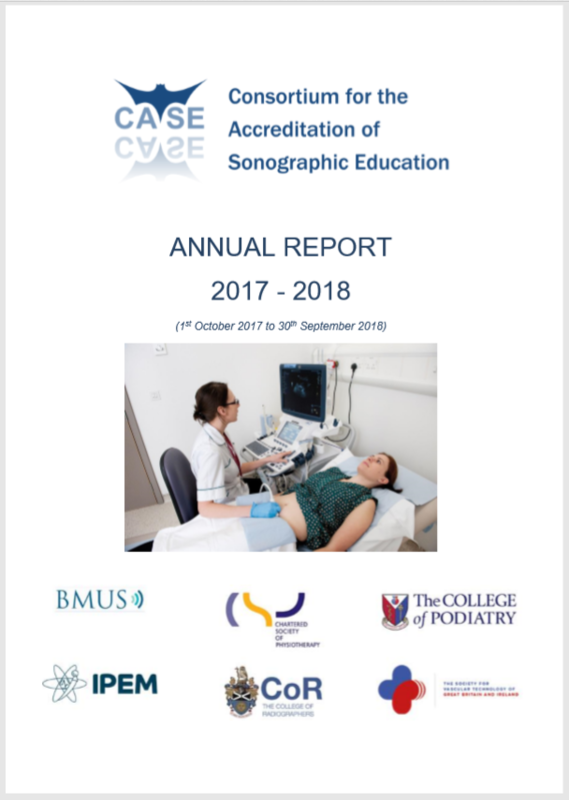 In addition to offering accreditation of new, and re-accreditation of established ultrasound education programmes, CASE undertakes annual monitoring of the courses it has accredited. The information obtained is fed back to the Institutions both on an individual basis and via the annual CASE report. To accredit high quality clinical* ultrasound education and training programmes (including focused courses, stand-alone modules and CPD) that promote best ultrasound practice and provide assurance that ultrasound practitioners are safe and competent to practice. To identify the current and future needs of service providers with respect to clinical* ultrasound education and training and advise on education and training to meet the changing service and workforce needs. To evaluate new and innovative training and education pathways at all academic levels and to accredit when appropriate to do so. To monitor CASE accredited programmes of ultrasound education and training to ensure they continue to meet appropriate standards. To assist with the development of ultrasound education and training programmes. CASE has up until July 2017 accredited clinical ultrasound education and training programmes that have been at Master’s degree level. With the agreement of the member organisations CASE will now have the flexibility it requires to evaluate emerging pathways and proposals for clinical ultrasound education and training and to accredit them when appropriate. These pathways could for example include undergraduate courses and degree apprenticeships. * The term ‘clinical’ recognises the multi-disciplinary nature of the workforce; in other circumstances the word ‘medical’ may be used.